UMass Arbor Education | Massachusetts Tree Wardens and Foresters Assn. In July 2015, the Arboriculture & Community Forestry program will host its second annual pre-college course in urban forestry and sustainable arboriculture – the art, business, and science of caring for trees in our communities. Students spend their time on campus, learning all the basics of tree care. UMass faculty (Professor Harper, Dr. Kane, and Dr. Ryan) teach classes in pruning, cabling, fertilizing, plant health care (PHC), tree ID, and tree climbing and pruning for seven hours a day, Monday through Friday. For more information, contact rharper@eco.umass.edu. The Stockbridge School of Agriculture offers a two-year degree program leading to an A.S. degree in Arboriculture and Community Forest Management, one of six majors in the Stockbridge School. The specialized courses and faculty advisors for this major are part of the UMass Department of Environmental Conservation. Students learn the principles and practices of tree planting, tree removal, control of insects and diseases, and other aspects of the arborist’s profession–and they get first-hand experience with all of these practices. Arborists are employed by cities and towns, commercial tree care services, utility companies, public parks, and golf courses. This program has been approved by arborist associations at the state and national levels. The University of Massachusetts Department of Environmental Conservation offers a four-year B.S. degree in Natural Resources Conservation with a concentration in Urban Forestry and Arboriculture. Stockbridge arboriculture graduates often return to complete this four-year degree. The department also offers graduate degrees in related fields. All students – two-year, four-year, and graduate candidates – are eligible to apply for annual grants in the form of MTWFA scholarships and also SETWAA scholarships. For the last several years, the Stockbridge School/UMass PLANET Student Career Days Team has competed in the national student competition sponsored by PLANET (Professional Landcare Network). This year 65 schools and over 750 students from across North America took part in the 2014 competition in Fort Collins, CO. UMass was once again a winner: the landscape crew took third place in the landscape installation, and the arbor team won first place for the second year in a row. See more results and a picture of the entire 2014 team. 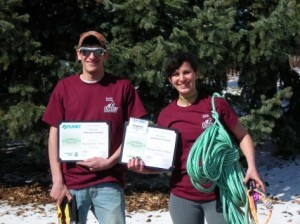 This year’s arbor team consisted of BS Urban Forestry student Luke Longstreeth and Stockbridge Arboriculture & Community Forestry student Nicolette Eicholtz, MCA (photo right). In 2013, Luke Longstreeth and Ethan Dangelo led the Stockbridge/UMass team to a first place finish in Arboriculture Techniques. MTWFA is a proud financial supporter of the Stockbridge/UMass team. In 2013, the University of Massachusetts marked the 150th anniversary of its founding as the Massachusetts Agricultural College. As the MTWFA marked its 100th this same year, together we continue to celebrate a long and mutually beneficial history. The close working relationship between UMass faculty and MTWFA and other professional industry associations has always been key to the success of the UMass arboriculture program. Many working in the industry today received their formal education at UMass, and the faculty continue to lend their support with many educational presentations at professional meetings.